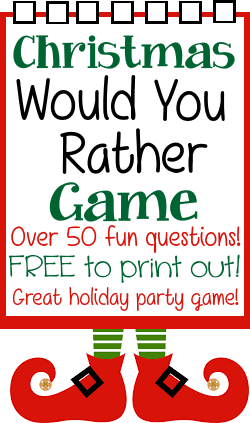 This is a fun holiday version of the party game Would You Rather. Players take turns answering questions about which answer they would choose if they had to choose from the 2 provided. Funny, thought provoking and a lot of fun for kids, tweens, teens and adult parties. Print out the questions. Cut apart into separate strips. Fold up the individual questions. Place in a jar or container. Players choose one question from the jar and read it out loud. They have to say which one of the two options on their paper they would rather do. Then the rest of the party group can answer the same question. For 200 more Would You Rather game questions see our Would You Rather regular game. For New Years Eve fun add these 25 New Years Eve Would You Rather questions! Would You Rather ..... ???? an Apple Pie fight with friends? or be followed by Frosty the Snowman? Help children take pictures with Santa at the Mall? 10 hours of Christmas movies? Smile really big at everyone and not say anything? sea of swirly whirly gumdrops? Drink only Egg Nog for a week? or wear an Elf costume to school for 1 week? or wear Jingle Bells on your feet for a week? talk with your Christmas tree? Sit on Santa's lap for 1 hour? on a beach with just a few of your family? Find the one light that is out on a string of Christmas lights a mile long? Holiday video and hot chocolate? 100 jingle bells for hair? a Jack in the Box toy? take a horse drawn sleigh ride? wear Christmas stockings for legs? stay with the Abdominal snowman for 1 week? light & keep 500 candles burning at once?